Flatter the mountain tops with sovereign eye. We are a nation of pie lovers. That is undeniable. 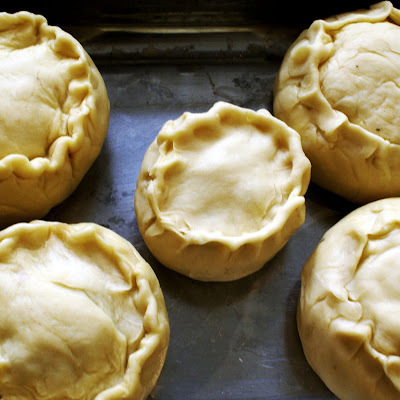 From steaming hot meat and potato pies that grace chip suppers across the north to the crescent shaped Cornish pasty of the south, if it’s a scorching filling wrapped in artery clogging pastry, we adore it. Legislative affirmation of this fact came just last month when the legendary Melton Mowbray pork pie was finally granted Protected Geographical indication by the EU. It now stands proudly alongside such luminaries as Parmesan Cheese and Champagne. Only pork pies from Melton Mowbray can be labelled as such. Anything else is a mere pretender. But pretenders aren’t necessarily a bad thing when they originate in your own kitchen. Recent dispatches from New York saw me trying to re-create some of the tasty food that was consumed there. It was great fun, making pizzas and bagels and hot dogs and cheeseburgers. So much so that it got me thinking – why not try it more often, with things that originate closer to home. Why not try to create in the home kitchen those foodie treats we know and love: doner kebabs, pink wafer biscuits, custard creams, marshmallows. By using excellent ingredients and leaving out all the unnecessary bits and bobs it should be possible to cook versions of these treats to rival anything that can be found on the shelves. Artifice by more natural means. Before I get started on the big things, I wanted to start small. Keep it simple. If my girlfriend and I are ever out and attacked by hunger pangs it inevitably falls not to a chocolate bar to quell the cravings but to a pork pie. There is something so satisfying about the combination of heavily seasoned meat housed in a crunchy yet melting pastry that just makes us smile. It is a rare treat, but a treat nonetheless. We’ve been hunting for the perfect pie for a while. One whose meat:pastry ratio is spot on and where the jelly doesn’t overwhelm you with its strangely appealing yet vaguely disgusting texture. It’s a fine pie tight rope to tread and some get it right. Others fail miserably. Hopefully now that the pork pie has some certification it will mark an end to any disappointments. This isn’t a traditional pie. This is me freestyling, throwing caution to the wind and rolling easy. The result? 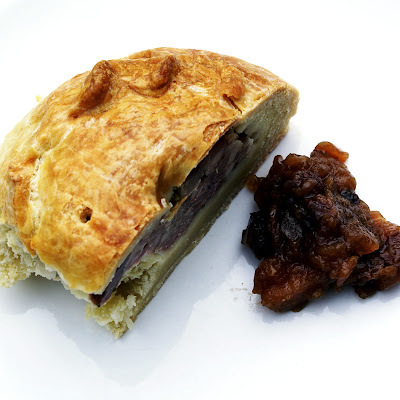 A perfect picnic item, great served with homemade chutney, just erring on the side of sweetness. For the filling you’re going to need some pork. Don’t scrimp here. Toddle over to your friend the butcher and ask him for some fatty shoulder or hand meat. While you’re at it inquire politely about acquiring some bacon offcuts. They shall be your new best friend and work out about a quarter of the price of regular bacon. Oh, and ask him to throw in a couple of pig’s trotters too, you’re going to need them later. Once you’ve got hold of your meat, head home, turn on the stereo and get cooking. Your first job is to make the jelly. Split the trotters down the vertical and them to the stock and the onions in a pan, bring to the boil and let it simmer gently for about three hours. Next up, make the pastry. Melt the lard and butter into the water over a gentle heat. Don’t boil it. Sift the flour into a large mixing bowl, crack in the eggs and stir them in. Gently pour the water/butter/lard mix into a glass, take a big sip and pour the rest over the flour and egg. Mix together until a dough forms, knead for a couple of minutes. It may need more flour. When you have a verifiable dough cover it with cling film and get it into the fridge. Finally, you’re going to need to dice the meat. Finely. And that means small. You could cheat and mince it but who wants a pie filled with sausage meat? Sharpen your favourite knife, crank up the music and get chopping. Once you’ve transformed your great hulks of meat into delicately fine dice, it will need seasoning. When cold, food can taste bland – as such be generous with the seasoning, especially the salt. I’d go for a teaspoon of sea salt as well as a pinch of everything else and a good grind of pepper. To check the seasoning, fry a little of the mixture off like a mini-burger and taste it (it’s a hard job but someone has to do it). Adjust as required. By now your pastry should be cool and far more workable than it was before when it was all warm. Take a cricket ball sized handful (or a baseball if that’s your thing) and roll it into a vaguely spherical shape. Don’t be too precious – this is a pie, not something to grace the plate of a three star Parisian temple to haute cuisine. 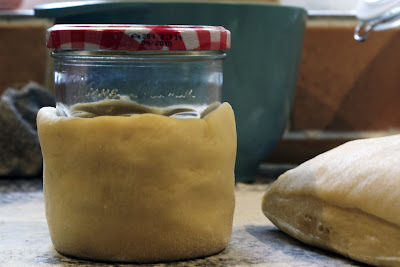 Once you have a rough outline, ease the jar free and pile in the filling. 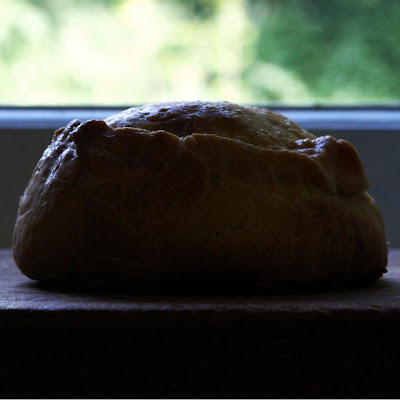 When you think it’s full, add another spoonful and ease the pastry around it. Cut off a piece of dough about the size of a ping-pong ball (gawd bless sporting analogies), roll into a disc and top your pie. Crimp the edges together, brush the top with beaten egg, poke a hole in the lid and place into a roasting tray. Repeat until out of dough or filling or both. Bake at 180 degrees C for thirty minutes then turn the oven down to 150 degrees and bake for another twenty minutes. Leave to cool on a wire rack and tend to your jelly. Trotters, being jam packed with gelatin, make an excellent jelly after simmering away gently for a couple of hours. Strain your stock through a fine meshed sieve, return to the heat and reduce by about a third. To see if it is ready, spoon off a little of the stock in a small cup and refrigerate. If it sets, it’s ready. If not, carry on cooking. Once the pies have cooled down you’ll need to get the liquid jelly into them, a procedure that those of you unskilled in veterinarian sciences might find tricky. I improvised with a syringe. I’ll leave it to you to find the best way (pouring is not, repeat not, the best way). Try and resist the temptation to bite into your pies before they’ve been refrigerated overnight. They are best eaten outdoors with a picnic blanket under your arse and a bottle of something cold and beery in your hand. For more high fat delights, follow me on Twitter. What a great post. Mouthwatering. I'm putting pork pies on my "to do" list, but it's probably not going to be for a couple of weeks. Too damn hot and humid to roll pastry out and run the oven right now. One question: What means "hand meat?" Not a term I'm familiar with. I did a pork pie a couple of months ago, to HFW's recipe. It was, to say the very least, a substantial pie, and it tasted magnificent. I felt a huge sense of achievement having done this. It's a culinary mountain that needs to be scaled. Good quote, too. Takes me back to year one English Lit at Leeds...old Will has a quote for everything. Nice work! Seriously though, the second hole in the pastry makes ALL the difference to getting the jelly in. Lovely looking pies - well done. But, you know, I'd seriously contest your assertion that anything that isn't a Melton Mowbray is a mere pretender. 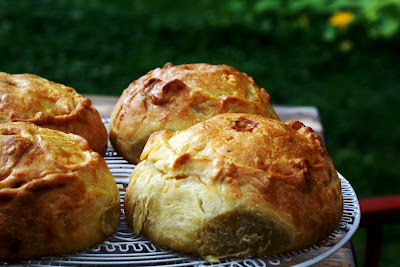 Pork pies are on my to-do list right now. "Gently pour the water/butter/lard mix into a glass, take a big sip...."
Dave - Thank you. You're right, the kitchen needs to be cool to work with pastry. Pork hand is a neat little cut sitting just above the hock and below the shoulder. Foodycat - Of course! The second hole to let out the air displaced by the liquid jelly. Why didn't I think of that? Helen - Take action immediately. What a gorgeous looking pork pie! 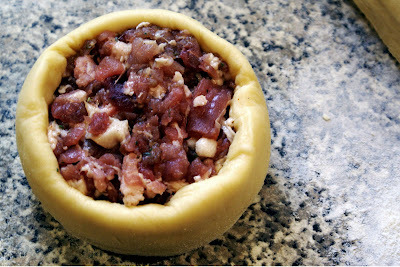 I've never made porkpie or not that I can remember anyway but I might just have to try my hand at this. Lovely post. Going to try this out when it is a bit colder outside. They look great. It's good to see there is a healthy appreciation for pork pies out there.